Traditionally, when a comic book character dies, it’s fairly safe to assume that they’ll eventually be resurrected in a not-at-all surprising turn of events. In Stephanie Barros’ Fantasma, though, a person’s life doesn’t even really begin until they die, which is cool. Less cool—people still have jobs in the afterlife. Movies like The Book of Life and Pixar’s upcoming Coco use the Mexican cultural concepts of death as the basis to tell soaring, visually stunning stories about the meaning of life. Fantasma hits a number of similar beats as those stories, but rather than focusing on a living person’s adventure to make it out of the land of the dead, the comic emphasizes the idea that once you die, you’ve got to be ready to reinvent yourself and to fight the occasional demonic piñata. Shortly after waking up in the afterlife, Fantasma learns that the dead and a number of supernatural creatures like vampires and werewolves all live together in an in-between space where they lead relatively normal lives. When given the choice between moving on to rest in peace (the true death) and becoming a spectral bounty hunter, Fantasma eagerly signs up to catch and collar unruly spirits who terrorize the living. 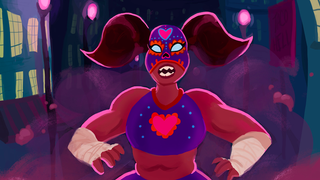 In exchange for her services at the La Parada Paranormal Defense, Fantasma gets free public housing and the chance to do what she does best—kicking butts and helping people. In a recent interview with Comisocity, Barros was candid about her desire to create a world with a solid sense of mystical whimsy and strong cast of queer Latinx characters. While Barros’ writing is terrific, Fantasma’s greatest strength lies in its lush visuals that are at once charmingly cartoonish and rich in detail. Fantasma’s the sort of web comic that’ll make you appreciate web comics and, best of all, you can read the entire series up to its most recent strip for free over at Fantasmacomic.net.